Portion increase is a hot topic these days, blamed for the obesity of younger generations. Most of the time I prefer smaller portions at restaurants, but I make an exception for hearty food that makes me feel like I’m at a family dinner. 1. Angelo’s Civita Farnese – Providence’s Federal Hill is an obvious choice for Italian, and Angelo’s – just past the famed pineapple on Atwells – has been serving up affordable home cooking since 1924. One of the reasons everyone loves Angelo’s is that you never know who you’ll sit next to, as it’s frequented by Providencians of every walk of life. Their eggplant parmesan has been awarded by the Phantom Gourmet. 2. Twin Oaks – Drive into a Cranston residential neighborhood and just when you think you’re lost, you’ll see a large (and usually full) parking lot. Just like the portions, the restaurant is gigantic, having grown immensely since its former life as a 1930s speakeasy. Waiters and bartenders dress to the nines, but you don’t have to. A classic cocktail should help you relax as you browse the menu, and don’t miss the daily specials. 3. Am I being selfish? I want to keep this one a secret. Like Twin Oaks, it’s hidden in a residential neighborhood. You can get a bottle of wine for just over the price of the average glass, and the leftovers last for several meals. Where is it? Maybe I’ll tell…one day. Last night I had the pleasure of attending Food for Thought, an annual event for which some of the best restaurants in Rhode Island come together to raise money for the Genesis Center‘s culinary arts training program. 1. El Rancho Grande – guests who hadn’t yet heard of this Mexican restaurant were asking for an address as they raved about the food. I’ve already had the pleasure of eating there but was still amazed – they brought the tenderest chicken in mole sauce, tamales both savory and sweet, shrimp in a red sauce and palm-sized sopas. 2. Gracie’s - I love everything I’ve eaten at Gracie’s, and their elegant dessert was no exception. Four delectable flavors were layered in a slim, cone-shaped vial: a puree of stewed amarillo cherries, Meyer lemon curd and two creamy mousses. To top it off, explosive pop-rock toffee and a star-shaped cookie brushed with gold dust. 3. Sunrise Land Shrimp - I was excited to try Sunrise Land Shrimp’s specialty: bugs! The crickets and grasshoppers were certainly snackworthy, but I was blown away by the mean-looking waterbug, which provides meat with a crab-like consistency. We were told the flavor would be much like a jolly rancher, which seemed hard to believe, but was spot on – tangy, fruity and very intense. I recommend the experience (to the non-squeamish, of course). 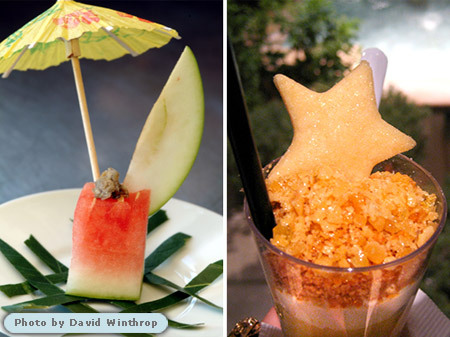 Cultural festivals are a fun and inexpensive way to get a home-cooked meal and a taste of culture. This fall, I made it to a church’s Greek festival and the German club’s Oktoberfest, both in Pawtucket. Put these on your calendar for next year! The German American Cultural Society in Pawtucket holds its annual Oktoberfest on a weekend in September (for up-to-date event listings, check out their website). Their club is in a Pawtucket residential neighborhood and seems quite inconspicuous – you’d hardly expect the mirrored ballroom, stage, and two bars hiding inside. 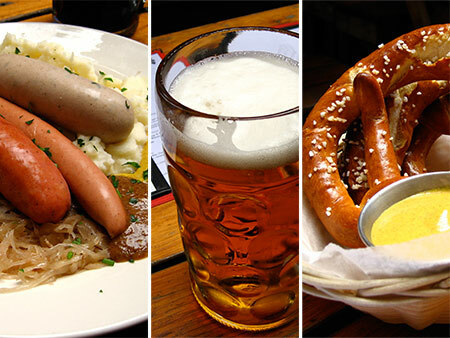 The Oktoberfest event has entertainment and some delicious food and drink options. Various sausages are grilled outside and served with sides such as potato pancakes. For dessert, you have your choice of home-baked cakes and pies. And of course, don’t forget the beer! This August was my first time at the Annual Grecian Festival, held at the Assumption of the Virgin Mary Greek Orthodox Church. If I knew how good the food was, I’d have been going every year. I had a sampler plate piled with Greek favorites like Spanikopita and Mossaka and my boyfriend tried the Lamb Shank. Just when I thought it was over, we noticed the pastry table, which was stocked with at least 8 types of pastry, each more mouth-watering than the next. What’s a girl to do? I got a box and one of each. 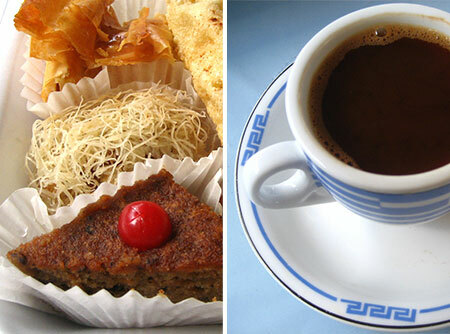 We also tried Greek coffee and Metaxa. Unfortunately we missed the entertainment – maybe next year. I grew up near New York City, so when I visit, I’m not drawn to the usual tourist attractions. Instead, I look to fulfill some need Rhode Island isn’t able to meet – odd stores, exotic cuisine, out-there art. Believe it or not, Rhode Island doesn’t have one German restaurant. So before my latest trip to the big apple, I made a map of all the German restaurants in Manhattan, pining for good beer and a sausage plate. Unfortunately we only had time for one, and we chose Loreley. Loreley is modeled after the pubs of Cologne, where the owner once lived. The biergarten’s communal tables will look familiar to anyone who has downed a liter in Deutschland, and the restaurant’s interior has an upscale coziness. Their 12 taps hold old favorites as well as seasonal beers (like Oktoberfest brews). They also offer Cologne’s specialty, Kölsch. We each worked our way through a liter – I had the Hofbräu Helles, my boyfriend opted for the Köstritzer Schwartz Bier, both were excellent. As for food (which was certainly needed to soak up the beer), we ordered freshly baked pretzels with mustard, currywurst, a plate of assorted sausages, and aged gouda-topped rye bread. We left satisfied, slightly tipsy and vowing to return. In America, the act of buying a cup of coffee has become synonymous with grabbing a paper “to go” cup. Though I’m guilty of the occasional paper cup, for me the price of coffee at a cafe does not only include pouring hot water over coffee beans – I can do that at home for a fraction of the price. I see it as a short-term rental of a seat and some atmosphere. Getting coffee “for here” not only buys the cafe experience, but if you are in the right cafe, also affords the feel of a warm ceramic mug and the sight of a well-made coffee (I often can’t resist a photo). 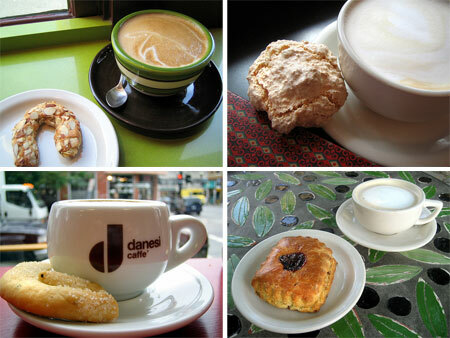 Here are some of my favorite places in Providence to get coffee to stay. Of course, there are many more, so this post might warrant a second installment.